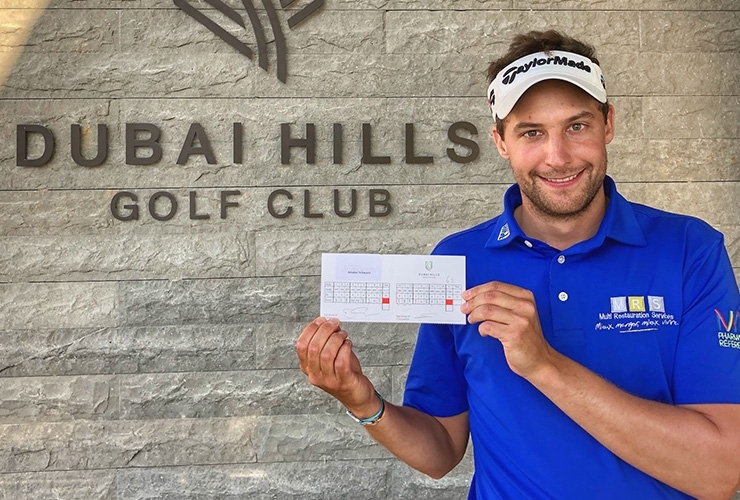 Antoine Schwartz flirted with the MENA Tour’s first ever 59 and had ample consolation even though he missed out on golf’s holy grail number on the opening day of the Troon Series – Dubai Open presented by Turkish Airlines. The 29-year-old Frenchman eventually settled for a 62 at Dubai Hills Golf Club and a five-shot lead over England’s Benjamin David, Scot Craig Ross and Dutchman Pierre Junior Verlaar heading into Wednesday’s second round. Schwartz also has a share of two records to cling on to as others need to make big moves on moving day; his 10-under-par effort matched the developmental tour’s lowest round in relation to par, a mark he now owns with South Africa’s MG Keyser and Dubai amateur Rayhan Thomas who both shot 61s at the 2017 Dubai Creek Open. His five-shot buffer also matched the circuit’s largest 18-hole lead, equalling the advantage Zane Scotland enjoyed at the 2013 Royal Golf Dar Es Salam Open, a tournament the Englishman went on to win for the third of his record 10 MENA Tour wins. Schwartz, who topped the Pro Golf Tour Order of Merit in 2016 and qualified for the European Challenge Tour last year, was two-under par after four holes with birdies on the 1st and 3rd, before unleashing a flurry of stunning shots over the next eight holes. He birdied seven of them and eagled the 11th before cooling down. A bogey on par-4 16th, where he hit a wedge shot from the middle of the fairway into the greenside bunker and failed to make his up-and-down was his only mistake of the day. The 10-under par 62 round was his best as a professional, bettering an eight-under-par 62 four years ago in Austria. “It was just an unbelievable day. I hit so many good shots today. Everything was just perfect,” said Schwartz, playing his first season on the MENA Tour. Schwartz hit 16 greens in regulation and needed just 24 putts to finish his round. “I was doing everything well, but I think the key was that I did not miss a single putt from inside four meters (12 feet),” said Schwartz. Seven players were tied for fifth at four-under-par after 68s. That group included Scotland, Journey to Jordan money-list leader Matthew Baldwin and fellow Englishman Luke Joy who was forced out of last week’s tournament at Ghala Golf Club after a suspected case of food poisoning. England’s Jack Floydd was the best of the 11 amateurs in the 120-strong field with a two-under-par 70, followed by his compatriots Curtis Knipes and Ben Davies (both 71). The winner this week earns an invite to the European Challenge Tour’s Slovakia Challenge (July 4-7). 72 – Joshua Greenville-Wood (ENG), Jose Rolz (GUA), Mark James (ENG), Tim Gornik (SLO), Robert Dinwiddie (ENG), James Allan (ENG), Aaron Leitmannstetter (GER), Jack McDonald (SCO), Maarten Bosch (NED), Erik Jonasson (SWE), Gabriel Axell (SWE), Oliver Ross (AM-ENG), Joshua White (ENG), Lindsay Renolds (CAN), Christopher Mivis (BEL), William Nygard (SWE), Daniel Gaunt (AUS).